Dan Watson, Head of Medical at London Broncos Rugby League, talks to us to give his preferred treatment pathways for rugby injuries, as well as advice on how to prevent them. With the onset of the 6 Nations, World Cup fever beginning to swell, and the premiership and amateur rugby season in mid-flow, rugby fans and players alike are now fully immersed in the sport. However, all this action inevitably brings more injuries with it: statistics from the professional game suggest that at least one or two players are injured during a match, the severity of which can vary. 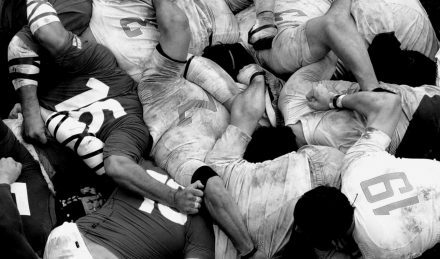 Rugby injuries often differ from other sporting injuries due to the contact nature of the sport, creating the need for specialised treatment, so what can you do as a healthcare professional to best treat patients presenting with injuries sustained on the rugby pitch? As a contact sport it’s very common to sustain an injury playing rugby at both amateur and professional’s levels. In season it’s a challenge for players to recovery fully from injuries as there is often pressure to play from coaches, team mates and fans. Players will often play with heavy strapping and supportive equipment in order to stay on the field. There are not many areas of the body that escape the demands of rugby. Frequent regions I manage include the knee, ankle, shoulder, hand and wrist. Head and face injuries are also common, ranging from cuts and bruises to concussions and fractures. In this article, however, I want to talk about shoulders, knees and ankles in more detail. These injuries occur in rugby due to the very high forces subjected to the upper body; specifically, the shoulder. These are often the result of landing on the shoulder, or making a tackle. The player will often report weakness and difficulty lifting the arm which doesn’t resolve after a few hours. In these cases, I suggest an Ultrasound scan which is highly effective at picking up small or large tears. Once a rotator cuff tear is confirmed an orthopaedic specialist should be consulted followed by a course of physiotherapy to restore strength and function. These occur when the shoulder is forced outside of its normal range limits. The most frequent cause is when the player is tackling with a high arm and it is forced backwards and externally rotated. Players should attend accident and emergency departments immediately to ensure the shoulder is relocated to its usual position. At this stage X-rays may be taken to ensure there is no fracture. I usually recommended an MRI in addition to the X-ray as players may suffer cartilage or ligament damage which, if not managed appropriately, can result in further dislocations. To reduce the risk of a shoulder injury players should focus on building and maintaining good shoulder mobility, strength and stability. Avoiding more than 2-3 contact/tackling sessions a week will also reduce the risk of a shoulder injury. These rugby injuries are typically traumatic, and occur most frequently when the knee is forced into the position known as valgus. This is a position whereby the knee moves across the midline of the body excessively whilst the foot is planted on the floor. It may occur if someone loses control of their leg when changing direction or landing from a jump. In rugby it may occur more commonly when tackled from the side and forcing the knee across the body. The knee will usually swell after sustaining an injury like this and players may complain of the knee feeling weak or unstable and/or difficulty bending and straightening the knee through normal ranges. An MRI scan should be performed if these symptoms cannot be explained or are not resolving after two weeks or so. In cases where there is a confirmed ACL, MCL or meniscal tear, players should consult an orthopaedic surgeon to discuss potential management. To reduce the risk of getting a knee injury, players should focus on preparing their bodies for the demands of rugby. Strong legs, good general fitness levels and avoid playing more than one game a week are good starting points. Developing good movement control when running, jumping and side stepping should also reduce the risk of these type of injuries. These tears are highly common in most sports and rugby is no different. These occur when the foot rolls away from the mid line of the body, the toes are usually in contact with the ground whilst the heel is off the floor. If a player is able to continue playing, it usually suggests a less severe injury and can be managed with a period of rest, ice and a short course of rehabilitation. If a player is unable to continue playing it may suggest a more severe injury. You can request an Ultrasound or MRI to ascertain the severity of lateral ligament injuries however, my preferred option is an MRI scan, as it allows me to assess if there are any issues deeper in the joint such as bone bruising. These rugby injuries are slightly less common than a lateral ligament tear. These ligaments are slightly higher than the lateral ligaments, (hence the name), and can be found at the bottom of the lower leg just above the ankle. Often incurred when the player rotates too much on a fixed foot i.e. twisting or changing direction quickly, these injuries can also occur when a player is tackled and their foot gets caught in the ground. I usually recommend an MRI scan for these injuries, especially if a player was unable to continue playing and is experiencing pain walking. Most lateral ligament tears and high ankle sprains can be managed by a physiotherapist; however in some cases, especially when more than one ligament is torn, it is sensible to seek an orthopaedic review. Ankle injuries may be prevented by developing strong calf muscles, undertaking regular stability and balance exercises, and developing good general fitness. This blog is for information purposes only and not to act as a guide for injury management. Players should liaise directly with a physiotherapist or GP if they have sustained an injury. Injury prevention strategies are best addressed on an individual basis and players can consult a sports physiotherapist or strength and conditioning coach to manage their specific needs. We offer affordable diagnostic imaging in London’s world-renowned Harley Street medical district. If you or a patient need a scan, we’re an efficient, affordable and quick option, with MRI scans from £200, Ultrasound from £250, X-ray from £40 and DEXA from £65. Dan Watson is a Physiotherapist and Head of Medical at London Broncos Rugby League, who have a pre-pay account with Oryon Imaging. Contact us to find out more about this offer.